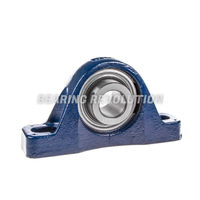 At Bearing Revolution we have a wide range of cast iron housed bearing units in stock and ready for dispatch, we stock all popular and hard to find cast iron housed bearing units in our stock range of over 12.5 million bearing related products. As well as stocking various premium manufactures, we can also supply the popular TR manufacture in the following series. 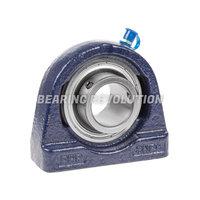 A pillow block (also known as a "bearing housing"), is a pedestal used to provide support for a rotating shaft with the help of compatible bearings & various accessories. Housing material for a pillow block is typically made of cast iron or cast steel. A wide range of dimension series exist to cater for all requirements. 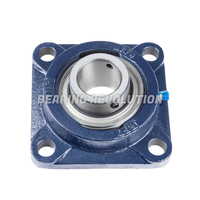 The UCP pillow block consists of a bearing insert with a spherical outer diameter in a 2 bolt cast iron housing. 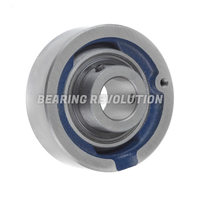 The bearing is usually fixed to the shaft by means of two set screws in the extended portion of the inner ring. Square Flange units are designed to fix to sides of a machine, which are vertical to the centre of the shaft. 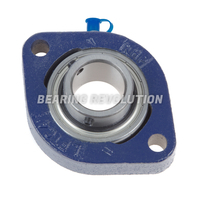 The UCF flange (RHP SF and MSF series) consists of a bearing insert with a spherical outer diameter in a cast iron housing. 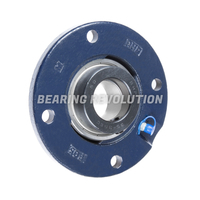 The bearing is usually fixed to the shaft by means of two set screws in the extended portion of the inner ring. 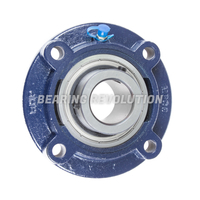 The UCFL 2 bolt flange unit (RHP SFT and MSFT series) consists of a bearing insert with a spherical outer diameter in a cast iron housing. 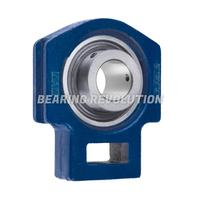 The bearing is usually fixed to the shaft by means of two set screws in the extended portion of the inner ring. 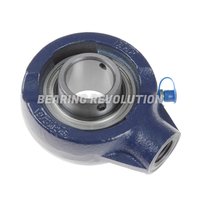 UCFC Series piloted round flanged units are suited to applications where precise location of the bearing is required. The UCFC (MFC) series round flange unit has a spigot in the rear of the casting that fits into a suitably toleranced hole in the mounting plate. The UCT Take Up Unit has narrow machined grooves either side to allow movement on suitably machined rails, and a tapped hole in the base to attach a threaded bar to facilitate adjustment. They are typically used for conveyor roller tension systems. The UCHA 200 Series is a cast iron housing with threaded base to allow easy mounting onto threaded bar. Typically used for screw conveyors. UCFB Series flange bracket units can be used in cases where space restrictions prohibit the use of 2 bolt or 4 bolt flange units. The Bearing Revolution team understand that there is wide choice of cast iron housed bearing units and choosing the wrong one can take up precious time, so if you are unsure on which product to purchase you can call us on 01952 222100 and we would be glad to help guiding you to purchase the correct cast iron housed bearing unit.